An unusual post for my blog, but one that I think is appropriate. Every time I go to London on external examiner duty for the University of Westminster, I make sure that I get the chance to see something at the theatre. Usually I’ll try to see something that is either political / legal in nature if there is anything in that genre. 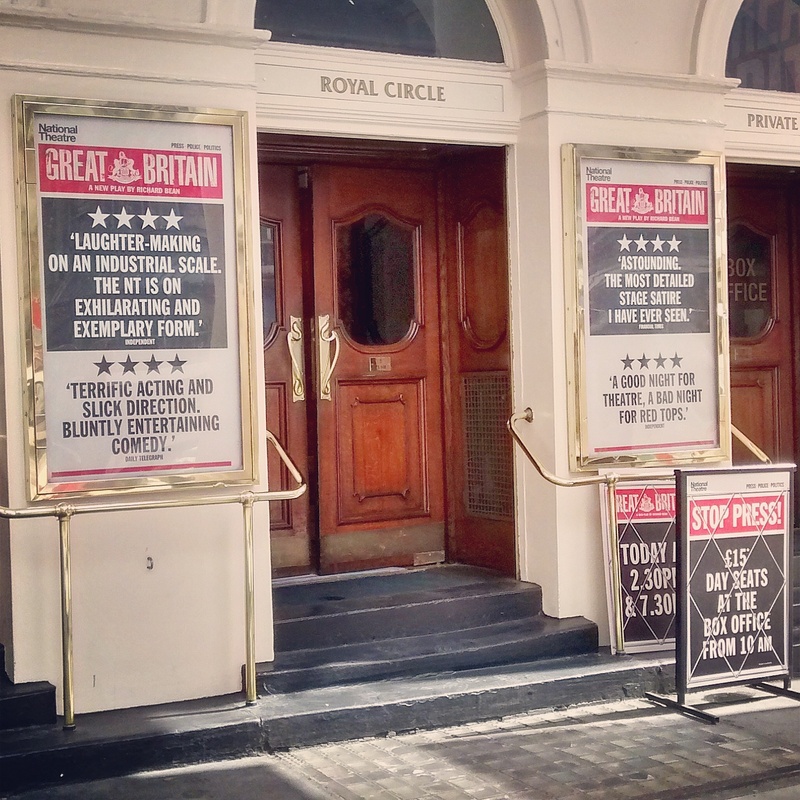 Luckily when I was in London on work during this past week, I was able to get a ticket to see the opening night of ‘Great Britain’ at the Theatre Royal on Haymarket on Tuesday 9th September. The production, written by Richard Bean, had previously held a successful run at the smaller Lyttelton Theatre during the summer months, and I was interested to see what all the fuss was about. 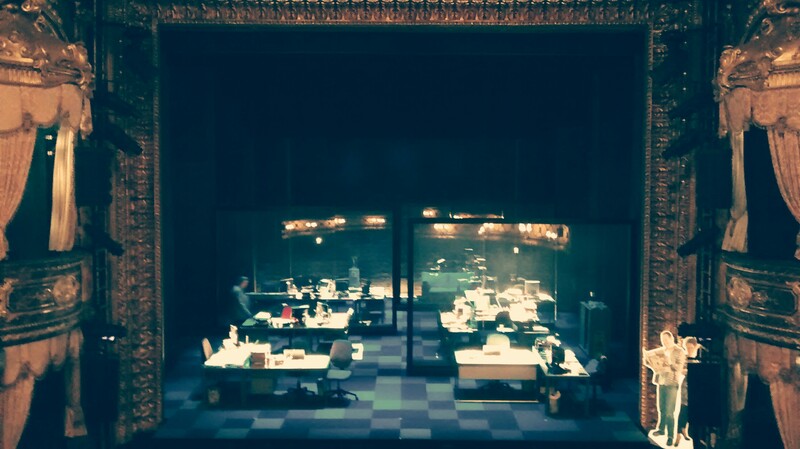 Essentially the production is a satire on the ‘News of the World’ scandal and Leveson inquiry, however it has strong elements beyond this that focus on both political and police corruption and incompetence. As such, whilst the humour is excetionally strong, equally for those that choose to see beyond the comedy, there are real moments that give you pause for thought regarding both individual morality and modern human nature in general. The way the production is structured is that the majority takes place in the newsroom of fictional tabloid newspaper ‘The Free Press’, with characters including the Murdoch-esque Proprietor played by Dermot Crowley, the vulgar editor played by Robert Glenister, and arguably the main character – Paige Britain (played by Lucy Punch), who is a ruthless up and coming news editor, who has frighteningly high ambitions to go as far as running the country from the murky shadows of the press by manipulating the leader of the Conservative party (Rupert Vansittart). Paige will stop at absolutely nothing to further her career and personal aspirations. Her journey takes us through initially minor areas such as employing people to go through the bins of celebrities, to more serious areas such as blackmailing members of the ‘Leveson’ committee who were investigating her conduct. The out of control spiral leads to the corruption of the previously clean Assistant Commissioner of the Police (Ben Mansfield), and eventually being caught after hacking the phones of fictionally abducted and killed twin children, and the suicide of their father after he was mistakenly arrested for their murder based on news reports stemming from Paige and her publication. All of the cast without exception were perfectly cast in their roles – there was nobody who was utterly dislikable or without some sort of redeeming quality, even if it was simply admiration for having such courage of their convictions that they were if nothing else entirely honest with themselves. 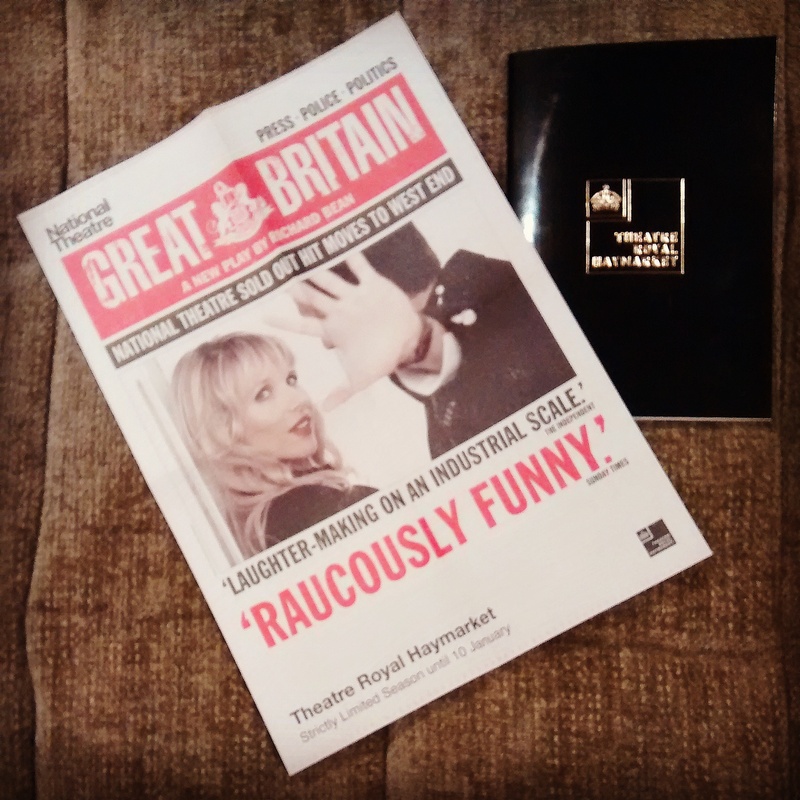 Undoubtedly though there were two stars of the show – Lucy Punch as Paige Britain, and Aaron Neil as the Police Commissioner. Whilst I have said a fair amount about Paige, as yet I have not discussed the Commissioner, who is characterised as little more than a puppet, but one who is unaware that this is the role he plays. He genuinely tries his best, but is simply clueless and in over his head. By far and away the best one-liners come from the Commissioner, and Neil’s delivery is absolutely first class. Little bits of detail such as the playing on the screen of modern phenomena such as ‘youtube’ videos that people have edited of his press conference announcements in the form of a mocking ‘music video’ genuinely add something to the performance, and had the audience in hysterics. As mentioned earlier however, it is not all about the comedy. There were undertones of morality and reflections of real life corruption present, undoubtedly deliberately, throughout the show. Most of these were genuine areas that would make you think, such as; were the police really that terrified of the media prior to Leveson that they would have evidence but cover it up for fear of being portrayed in a bad light? Is whistleblowing, when made to the press and not the authorities truly ‘corruption’? (This I think I could write a blog on its own right in, so I’ll not answer the question) What really are the limits of freedom of expression and the ‘public interest’? In particular we have to reflect on the lengths some people go to just to achieve fame, and where does it really lead when we are faced with the character of Stella (Kellie Shirley), a young aspiring glamour model, who starts off agreeing to drop a dress size and have cosmetic surgery before being given a contract as a ‘page 7’ model, and eventually is accepting a large fee for the newspaper to have exclusive rights to her death inevitably coming as a result of an eating disorder. One area that I do think was misguided, and for me did not really work was late on the performance when Paige took centre stage to ‘tell’ the audience that we didn’t really care about phone hacking when it was all about the celebrity gossip, and we only cared when there was a moral outrage over the eventual hacking of the dead children’s phones. Paige laments that had the hacking resulted in the children being found alive then she would have been a hero, but as in reality it only led to headlines and the arrest / suicide of the father she was painted as a villain. This monologue is an attempt to make the audience feel uncomfortable about their morality as it forcefully asserts unequivocally that we ‘all’ were guilty of this. I for one have never thought celebrity gossip of the nature put across by the tabloids is okay, nor have I ever thought that phone hacking etc. were ever acceptable as I believe that people have a right to a private and family life. Perhaps however this is due to my roots as a lawyer, and the fact that I have taken an active interest in issues relating to press activities and regulation since I taught media law for three years, and still act as an external examiner in the subject. Of course, eventually it all comes crashing down around Paige, the Commissioner, and most of the other characters who had been corrupted, though the twist at the end is shown as Paige, following her inappropriately lenient punishment, manages to find huge celebrity herself as the host of a US talk show purely as a result of her former infamy, making the audience wonder, is there ever truly a way out of the sleaze, or will the cycle forever be perpetuated. Overall, this was a superb production that should appeal to a wide demographic (though definitely NOT appropriate for children due to both the subject matter and the coarse language throughout), with a number of levels of comedy, satire, political commentary, and self-reflection. If you are in a position to see this, take the chance while you can. I would definitely rate it as five out of five.